Old Sturbridge Village’s expansive and diverse collections reflect things made or used in rural New England between about 1790 and 1840. We are especially interested in objects with known history, that is, who made or used them, and where and when. Due to the volume of donation offers Old Sturbridge Village receives, we cannot accept donated objects without a completed donation form. If you have material that you believe would add to the Old Sturbridge Village’s collections, please use the Online Collection Donation Form below. Please do not send the original materials you wish to donate until you have been contacted by a member of the Curatorial Staff. If you are unable to complete the online form, please call 508-347-0319 and request a copy of the donation form via regular mail. Donation forms must include photographs and measurements of the object(s). Please also include any pertinent historical information – how you acquired the object, what you know about it, etc. Once the form is received, your proposed donation will be reviewed by the Old Sturbridge Village Curatorial Staff. The Curatorial Staff carefully evaluates every proposed donation to ensure that it fits within the scope of the Village’s collecting policies. The Village also considers the condition of an object(s) as well as the resources required to store, care, and preserve the object(s) and its history. If the Village chooses to accept the donation, the Curatorial Staff will work with you to receive the object(s). Donation offers are reviewed first by the Curatorial Staff who make recommendations to the Collections Committee. The committee is composed of Trustees, Honorary Trustees, and Overseers, knowledgeable in the scope and content of the Village’s collections. Collections Committee recommendations are reviewed and voted on by the Village’s Board of Trustees. Following the Board’s approval of the donation you will receive a Deed of Gift form, documenting the transfer of ownership of the object(s) to Old Sturbridge Village. Old Sturbridge Village does not accept donations through the mail or in person unless prior arrangements have been made with a member of the Curatorial Department staff. All unsolicited donations sent via the mail will be returned to sender. How long does it take to review proposed donations? The process can take between 3 and 4 months. All donations must be reviewed by the Curatorial Staff, Collections Committee, and Board of Trustees. Staff recommendations are presented quarterly to the Collections Committee and Board of Trustees. Can you appraise my donation for its monetary value? Old Sturbridge Village does not provide appraisals of the monetary value of proposed donations or for any other reason due to ethical considerations. To find a licensed appraiser in your area, contact one of the following organizations for a referral: the American Society of Appraisers, the International Society of Appraisers, or the Appraisers Association of America. 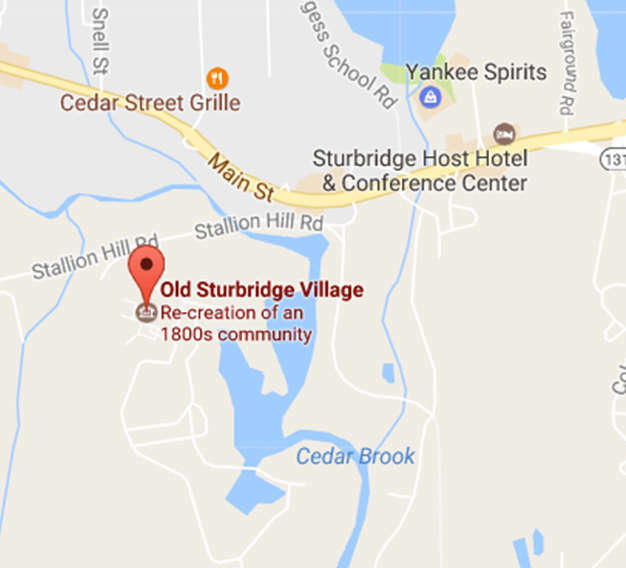 Will my object(s) be exhibited at Old Sturbridge Village? Old Sturbridge Village cannot guarantee that any materials donated to the collections will be exhibited. If I donate material, will it be returned to me at my request? Old Sturbridge Village cannot return accessioned collection material to the donor. Once a donation is approved by the Board of Trustees, you will be asked to sign a Deed of Gift form, which legally transfers ownership of the object(s) to Old Sturbridge Village. Can donated materials be removed from the collection? Old Sturbridge Village may, with approval from the Board of Trustees, remove historical materials from the collections through a process called deaccessioning. Objects that conform to the deaccessioning criteria as described in the Collections Management Policy (e.g., objects determined to be outside the scope of the Village’s collections; deteriorated objects beyond reasonable repair, etc.) may be considered for deaccessioning. Deaccessioned material may be donated to another museum or cultural or educational organization, destroyed, sold, or disposed of in another manner that the Village sees fit. Any proceeds from the sale of deaccessioned historical material are placed in a restricted collection acquisition fund. Thank you for your interest in donating your object(s) to Old Sturbridge Village. We are especially interested in objects with known history, that is, who made or used them, and where and when. If your object meets the above criteria, we’d love to know more! Please describe your donation below, being sure to include information about its condition and historical significance. We also ask that you include photographs of the object(s). Please do not send the original materials you wish to donate to the Village at this time. Please be as specific as possible. Include a physical description as well as any marks or inscriptions. How big is it? Provide any historical significance - Who made it? Who used it? How did you acquire it? Is the object damaged? Has it been repaired? Repainted?